Brief Description of Subject: On the shore of the Sea of Galilee, Jesus is asking Peter and his brother Andrew to leave their former lives and become his Disciples. This window was donated by the Belen family in memory of Elizabeth and Christopher Belen, the parents of Lucile Belen. Christopher was a member of the building committee when the present sanctuary was built and remained active in the church. He passed from this life into eternity in 1960. Elizabeth departed this earthly life in 1975 at about the time the stained glass window project was getting underway. The memorial gifts given in her honor, along with funds from the family, purchased this window. It was installed on June 2, 1976. This window also has in each corner what looks like the letter “X” - the Greek letter Chi, which is the first letter of the word Chistos from which we get the work Christ. Again in this window, artists have given us a contemporary rendition of a traditional theme, including some of the classical elements in the design. 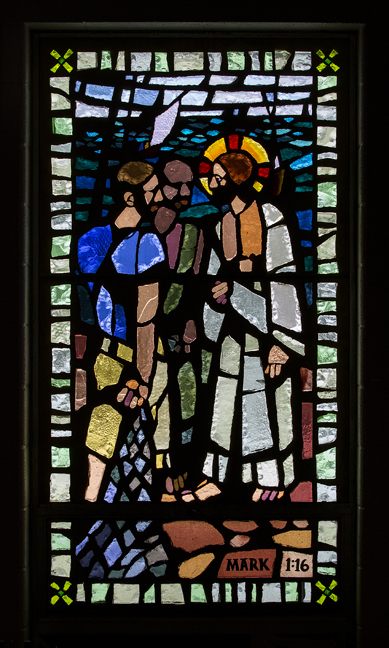 This window shows Jesus’ calling of the first disciples: Andrew and his brother Simon Peter. The following verses mention the calling also of the sons of Zebedee, James and John (sometimes called the “sons of thunder”!). The setting is the shore of the very large lake sometimes called Lake Gennesaret and better known as the Sea of Galilee. In the background, a fishing boat sails in the blue waters of the lake. A second boat, which may be anchored at the shore, is just visible over the left shoulder of Jesus. In the foreground, we see Jesus with the nimbus or halo that became an element of religious art during the Middle Ages. Jesus is talking to two men, Simon (better known as Peter) and his brother Andrew. Andrew is holding a fishing net, which is one of his attributes or one of the elements used in classic religious art to identify him. According to the scripture text, Jesus is asking the brothers to make a life-changing decision: to leave their former lives and livelihoods and to become Jesus’ disciples. Installed May 28, 1976, and dedicated June 6, 1976. Artists Richard Hanley and Mark Taleba. Installation by Omnibus Studios, Okemos, MI.